A couple weeks ago, I did my ‘unbox’ review for the Popcorn Hour which was well received, so I thought I would go much more in-depth. 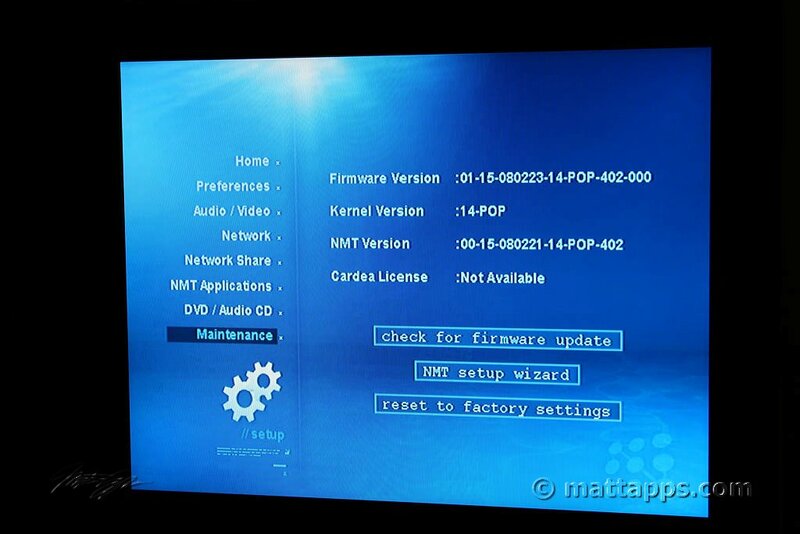 This is part 1, which covers setup of the device and many of the setup screens. Later parts will go over video playback as well as all the streaming capabilities. 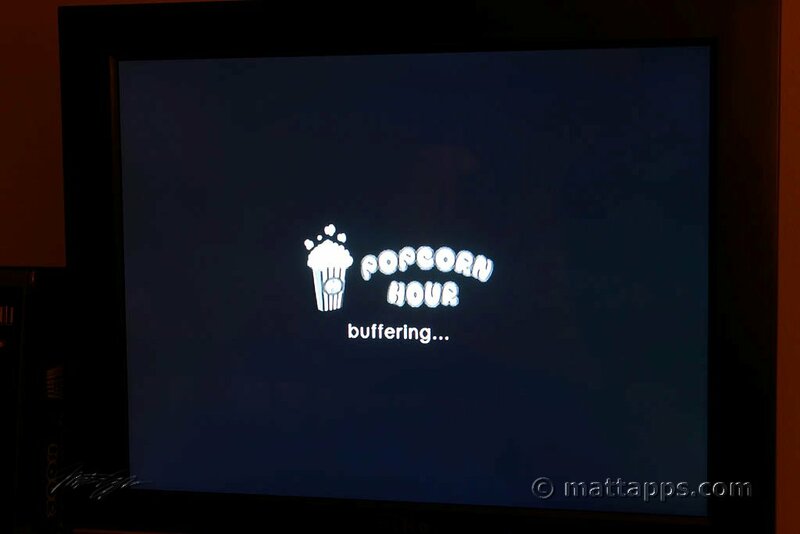 One of the more interesting devices I’ve used in quite awhile, the Popcorn Hour (PCH for short) is a device that I’d best describe as a cross between Apple TV (which I don’t own, but based on the specs), a media center computer and the some of the on-demand services you’d find on your cable or satellite box. It closely resembles a Mediagate MG-35, which I’ve had for awhile, but does so much more. The kicker is, it’s only $179 (w/out a hard drive) and for the money, is about as good a deal as you can get for the uncrippled feature set. 1) Format your HD first – If you decide to use a hard drive with it (which I would recommend since you can use bittorrent then) , I would recommend formatting it prior to putting it in the device. I didn’t, and the PCH wasn’t recognizing the hard drive. I pulled it out, hooked it up to a very handy IDE to USB device (everyone should have one of these) to get it quickly formatted. Putting it back in the PCH, it worked fine then. I went with a Seagate 750GB (got it from Fry’s actually). NOTE that the interface is IDE and not SATA…something I was surprised for such a new device, but not too big of a deal. 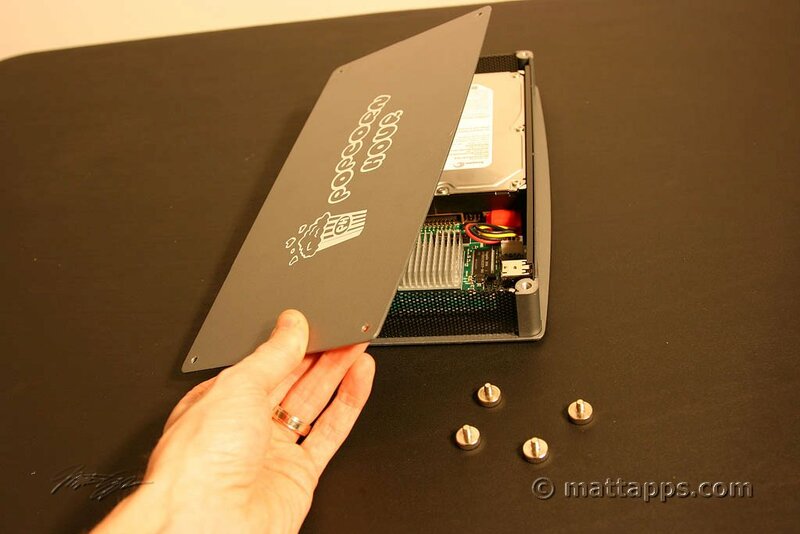 2) Read the directions – yeah, I know you don’t do this either. 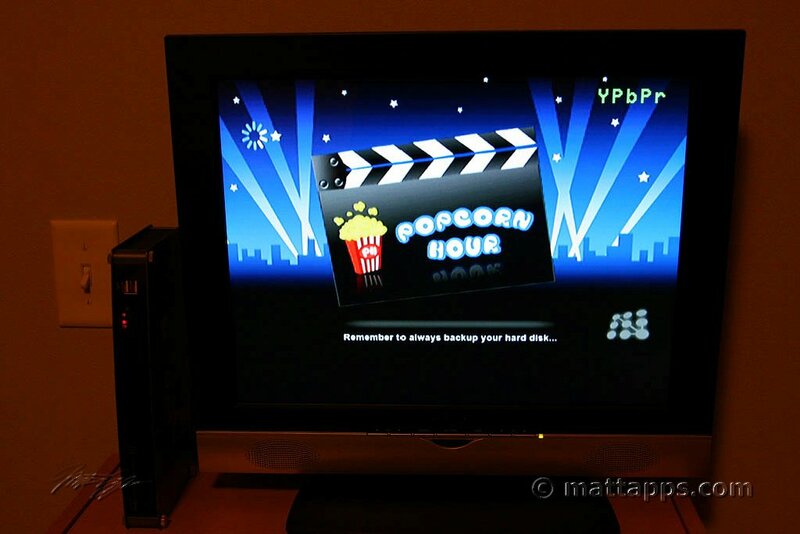 After formatting, I decided to load up some divx on the HD before re-installing it back into the Popcorn Hour. I did that, but then things were working a bit oddly. 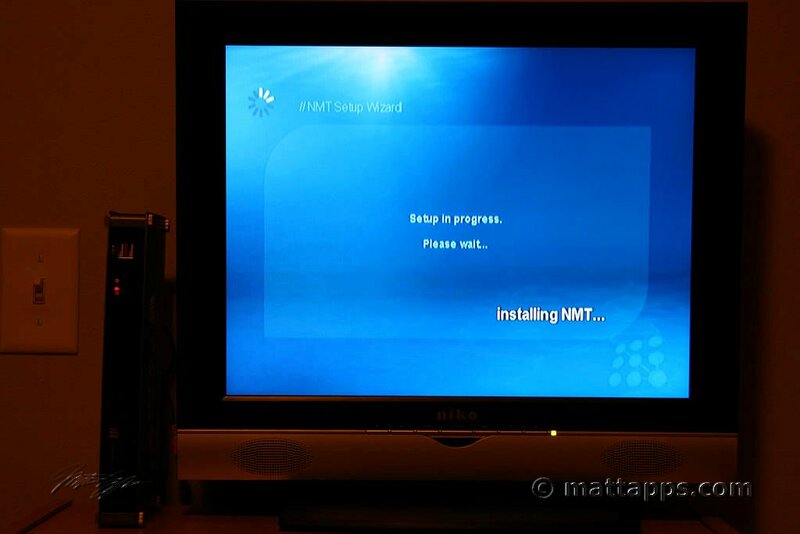 So after reading the directions, I found you need to set up the NMT application suite. After doing this all was well (see screens below with NMT setup). It does delete everything off the drive though, so I had to copy things back on to it. 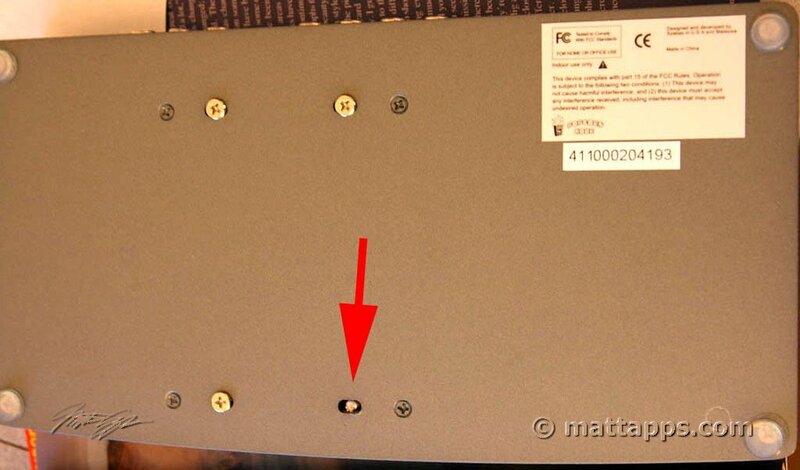 3) Watch the screws on the HD – I don’t know if the holes weren’t lined up quite right, but I busted off one of the screws while installing the hard drive! Some folks may be turned off by the fact that there is no wireless on this device, but I was fine with it. Since this thing plays about everything you throw at it (including HD containers like .mkv) this would probably fail miserably over 802.11g (802.11n might be another story, but alas, no true standard yet, so a moot point). I unfortunately don’t have a Cat5 network in my house, but am a big advocate for HomePlug AV. This standard uses the electrical lines in your house as a network, and works surprisingly well. You simply plug one of these near your router and attach a cat5 cable to it and then plug into an electrical outlet. 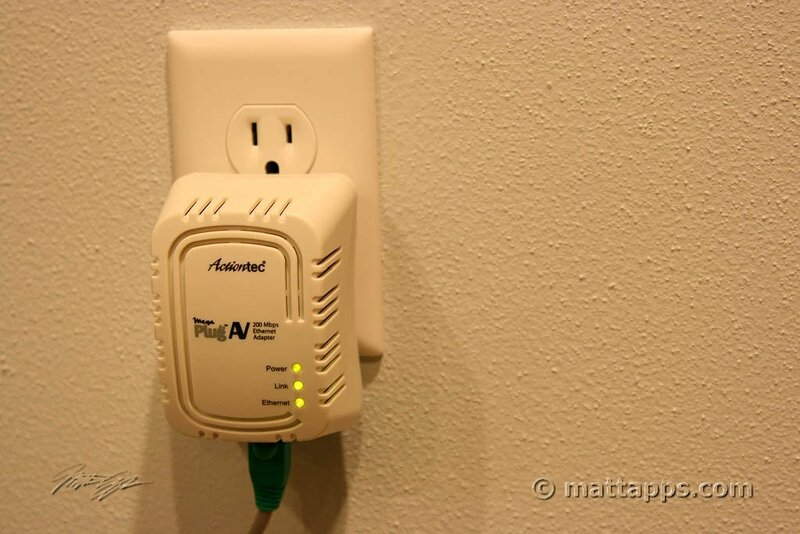 It is now essentially shooting your network throughout the entire electrical network in your house! Now you simply grab another of of these (they come in pairs typically), and then plug it in near your PCH, hook up the CAT5 and you are set. I’ve been able to play most everything over the network, which is nice if you don’t have all your media on the PCH hard drive locally. 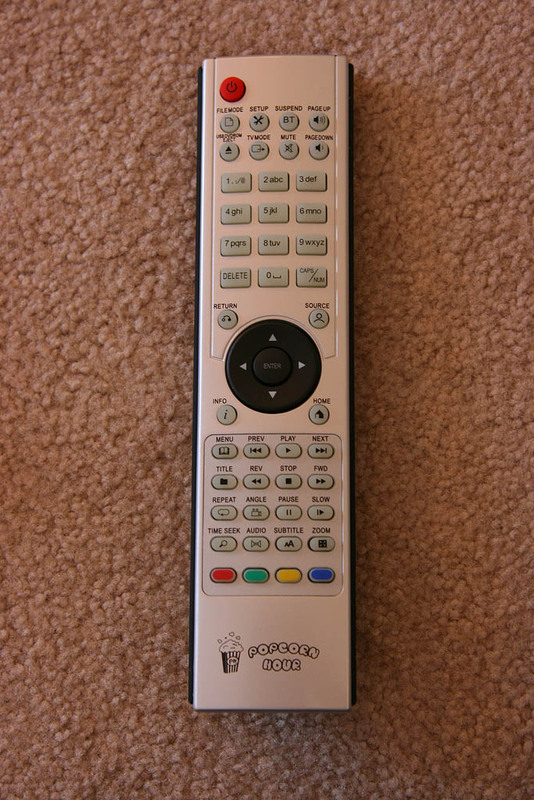 I use the Actiontec MegaPlug A/V 200 pictured above. While you don’t need these if you already have cat5 through your house, you’ll obviously need to do something to get this on your network if your TV isn’t anywhere near your router. You can use a bunch of these to attach computers throughout your house if you don’t want to use WiFi. You should get better throughput rates with these than with wireless over 802.11G. 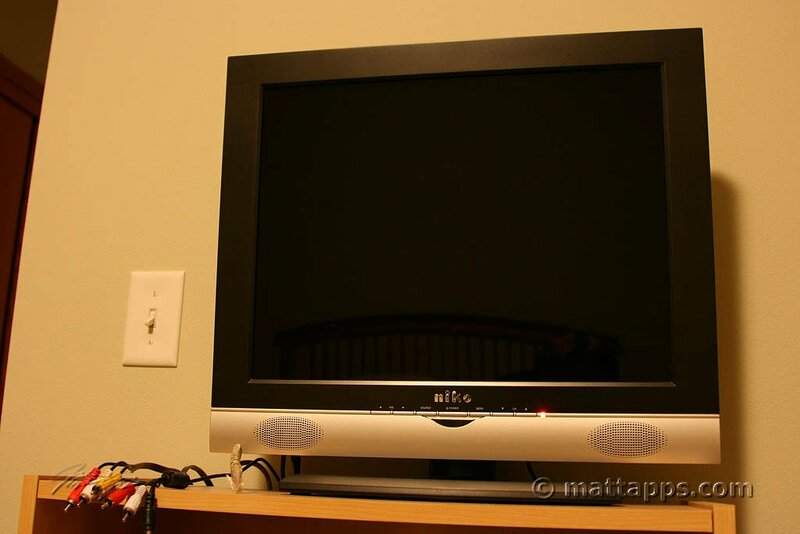 The TV I’m using is a Niko 20″ LCD-TV that I’ve had for a couple years (below). It’s not HD, and it doesn’t have HDMI either. 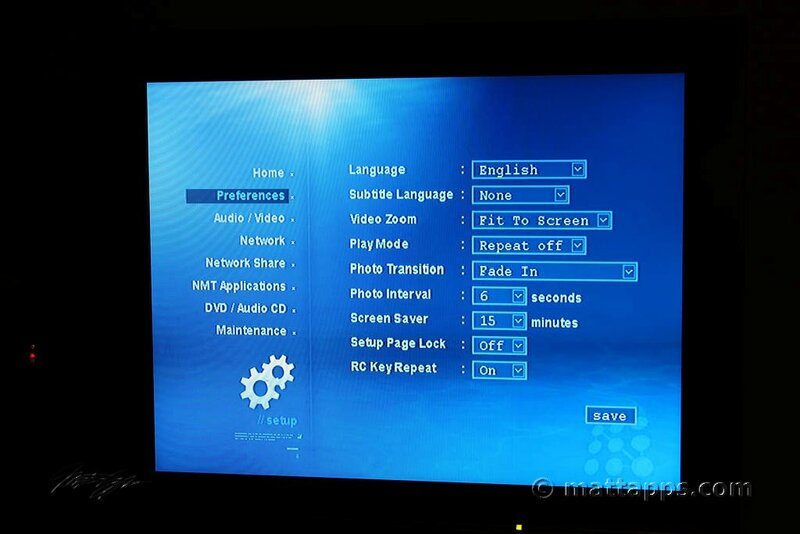 (NOTE: My 42″ Philips plasma already has an aging MSI Mega 180 computer hooked up to it, so the Popcorn Hour would actually be a step down for that. If I didn’t have a PC hooked up to it already, I would definitely be hooking it to the plasma though). 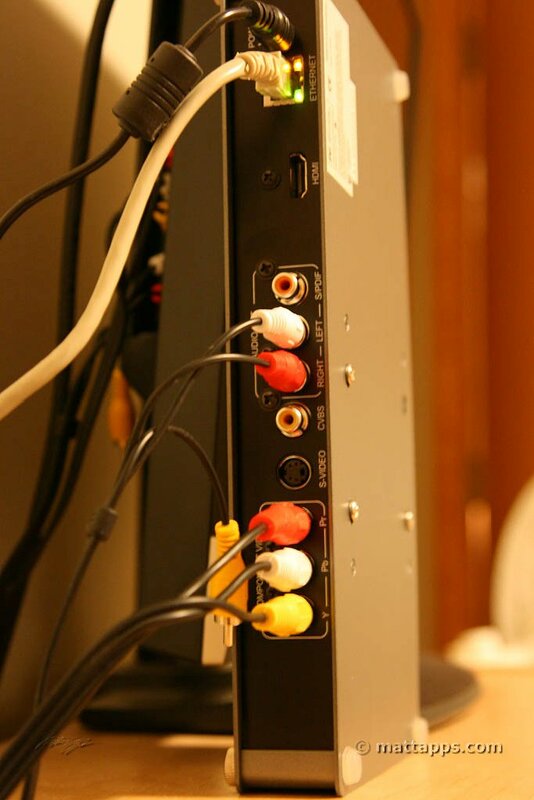 Since I have no-frills audio and sound on the TV I’m using, I’m simply using component video and RCA sound for the hook-ups. 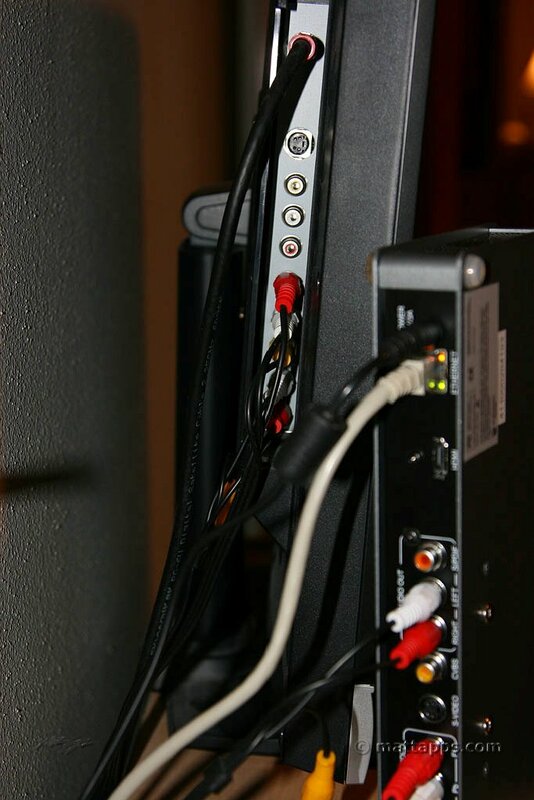 With this setup, it does successfully do 480p which does look quite clear over component. In the future, I may hook this up to my plasma to test some of the HD and HDMI functionality, but for this review, I’m using the 20″ non-HD. Sometimes the best way to experience a device and see if it will work for you, is to just see all the setup screens. 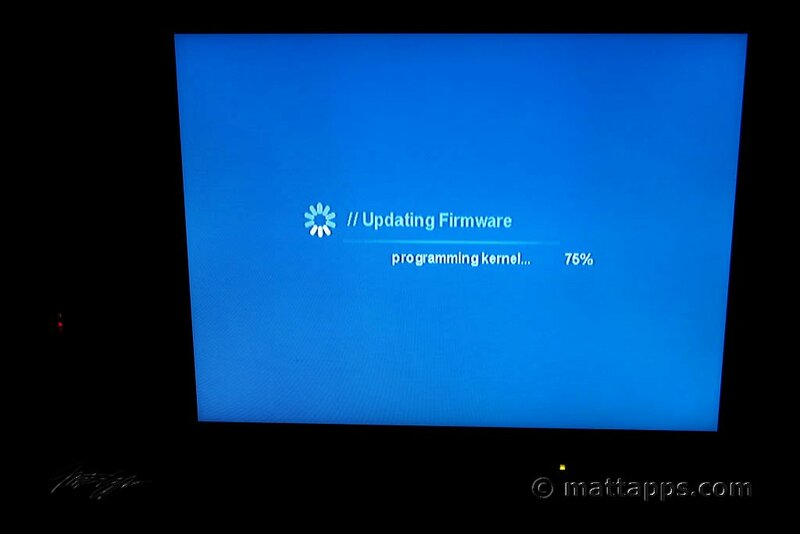 Main startup screen (after I’ve added a couple of network shares), and after clicking hard drive. Clicking “setup” on the main screen, you’ll see a bunch of preferences you can set which deal with the more general functions. The audio/video is next which allow you to configure a number of settings dependent on your setup. 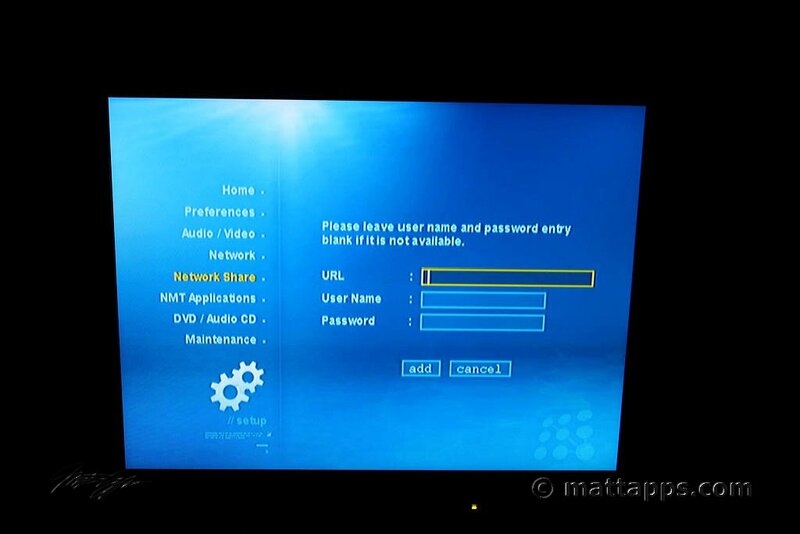 Network setup screens – You can do dynamic or static IP. 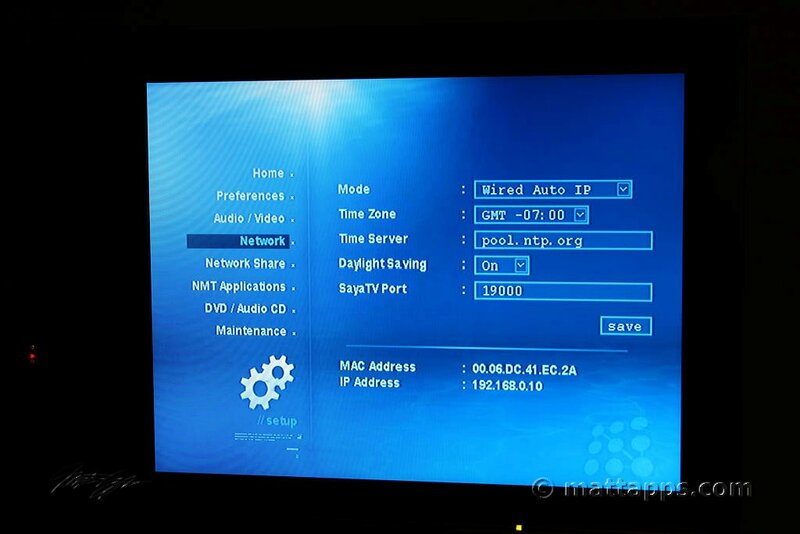 Grab the time off a time server and set up the Saya TV port (note, I hadn’t passed this through my router and it still worked, but not as well). Adding a share was easy. You can do it by browsing (easiest) or by typing in the URL which is not very fun with the remote. You have to have shares already set up on your network which I did, so this was a snap. 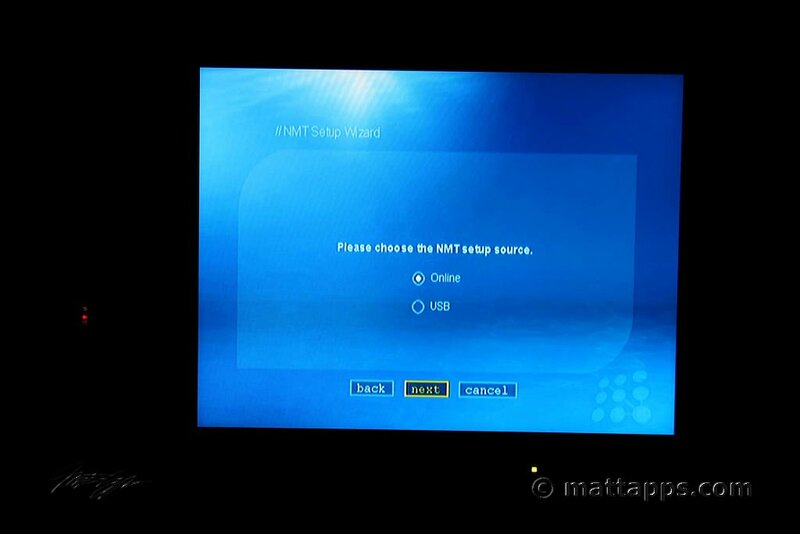 NMT Applications – When you have a hard drive installed, you can use the NMT applications. This makes your PCH much more interesting. 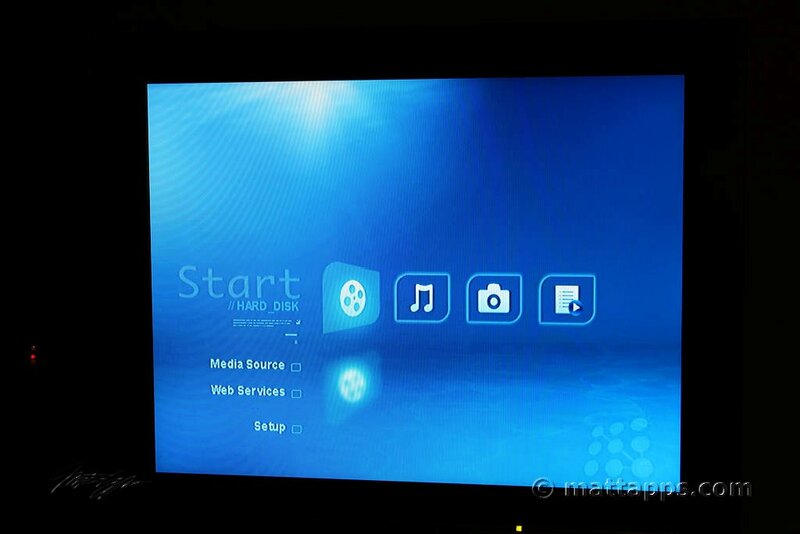 The second screen is what you see when you want to set up the torrent ports. Though all my servers are running, I didn’t use everything. 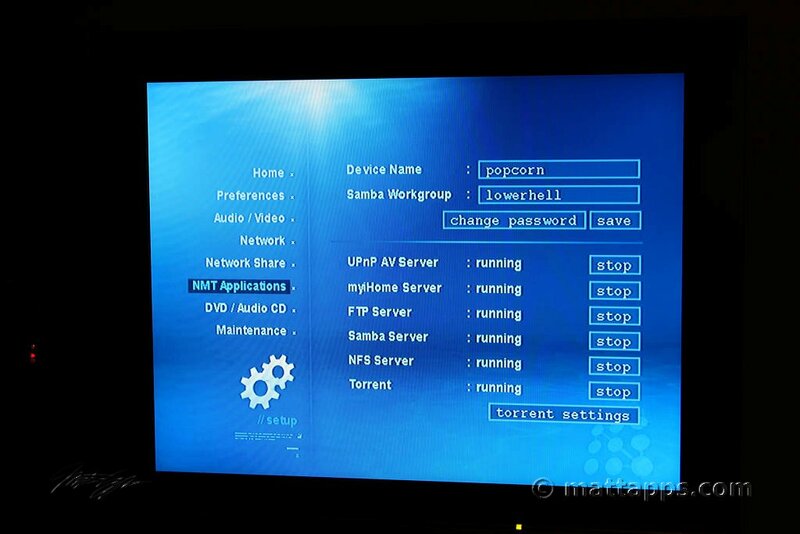 I tested Samba (basically using your PCH as a NAS which works well), FTP, Torrents and the webMyiHomeLite HTML server. It is nuts the stuff included here… quite impressive! 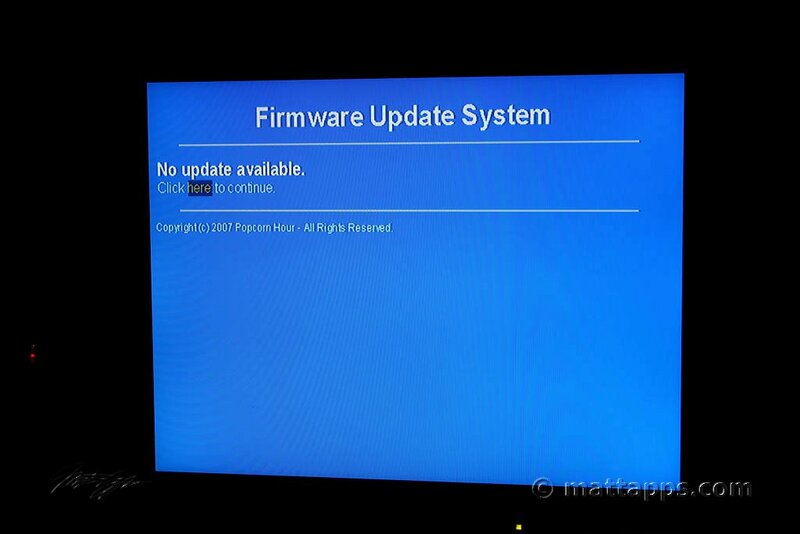 Watch out with firmware upgrades though…it was a pain as they started adding passwords w/ the firmware updates and didn’t make it clear what they were… that’s pretty annoying, but finally found it on their discussion board. DVD Audio CD – Note that TV type is in here which is a little puzzling… A lot of these settings could be in a number of places, so be sure to check out all the menus if you are looking for something specific! Also note the number of languages. 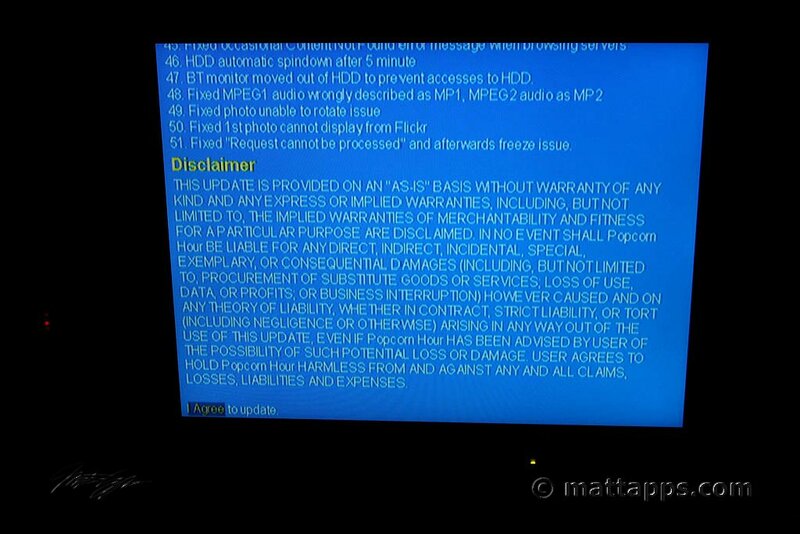 Or be presented with the following screens. This worked very well without any problems. It probably took about 15 minutes to run through it all, and they explained everything it was doing. Doing this over the Internet was no problem either. 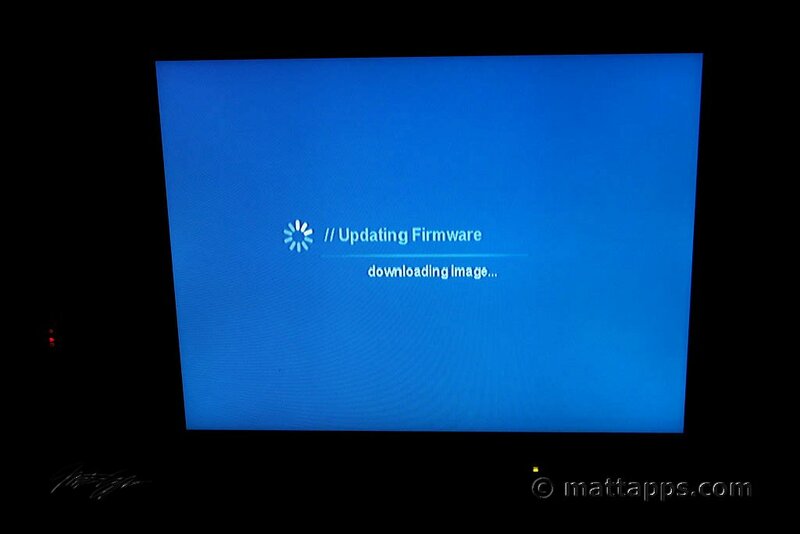 One of the best upgrades from this version of the firmware, was that the hard drive shut off when you shut off the Popcorn Hour. Prior to this, it would shut off, and then kick back on… with the 750GB drive I have in there, it does get a bit loud when on, so I’m glad they fixed this. 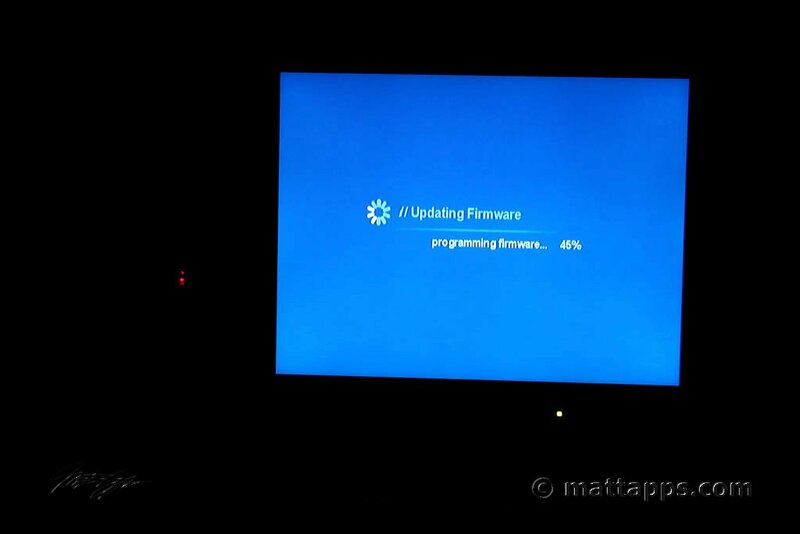 If you access the drive over your network, the hard drive will whirl up, but will shut off after 5 minutes if nothing else is happening. 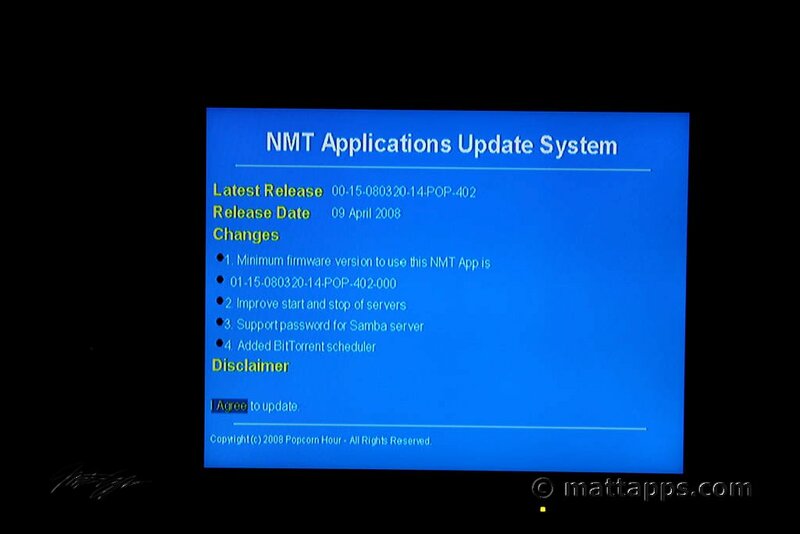 After the firmware setup, I was prompted to also update the NMT applications. This is the same setup that you would do initially as well when you first get your PCH. As for sharing over the network, this thing works very well. You can put all your media on here, and access it on any computer. 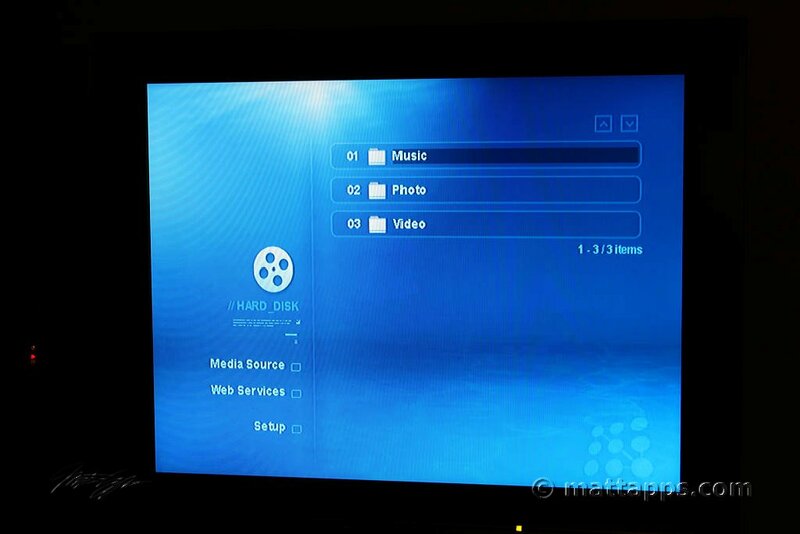 Interestingly, I accessed movies stored on the PCH from my MediaGate–all over HomePlug–and it worked with no issues. Playing files off of the hard drive is very fast, and if you shut off the device and turn it back on, it stays logged in wherever you were at, saving you time. 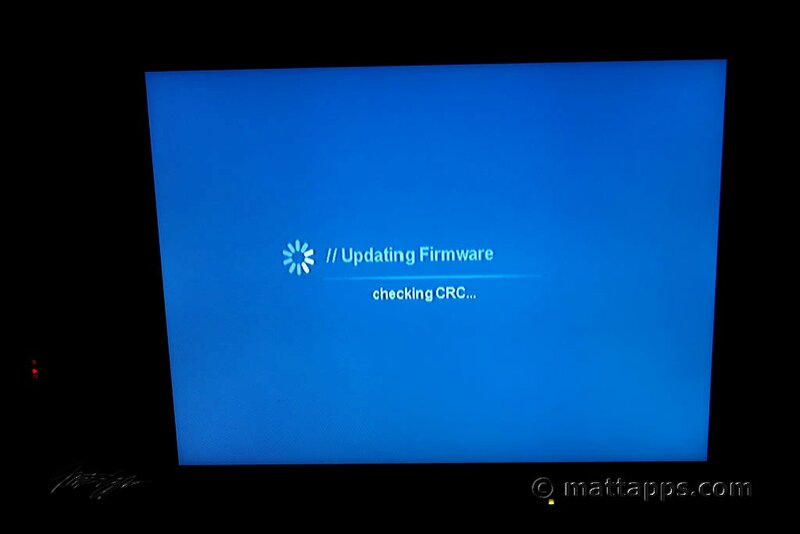 That’s it for the setup screens and the installation. 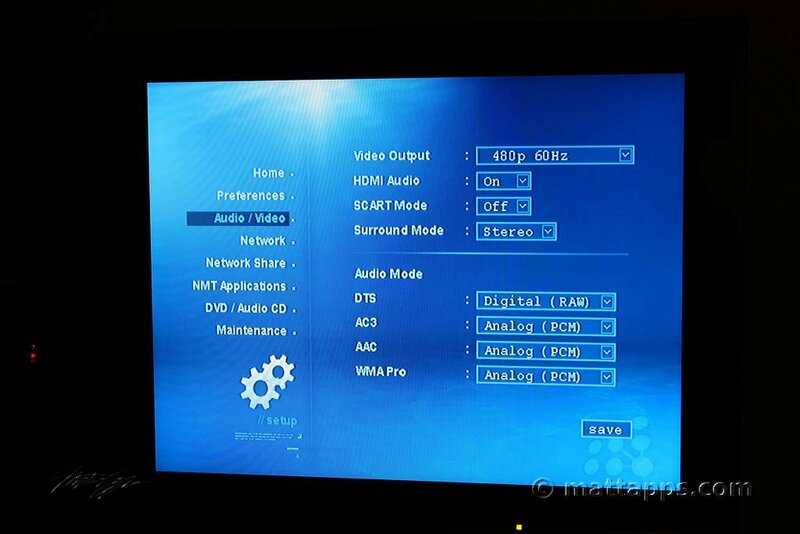 For Part 2, I’ll dive into video and audio playback as well as the web features. So far, they work very well, but do have some quirks. All-in-all, this device is performing quite well! Hey, just wondering .. does this box have a wireless adapter built in? Nope, no wireless. That’s why I use HomePlug for it. Wireless isn’t fast enough (at least 802.11G isn’t). Hmm. 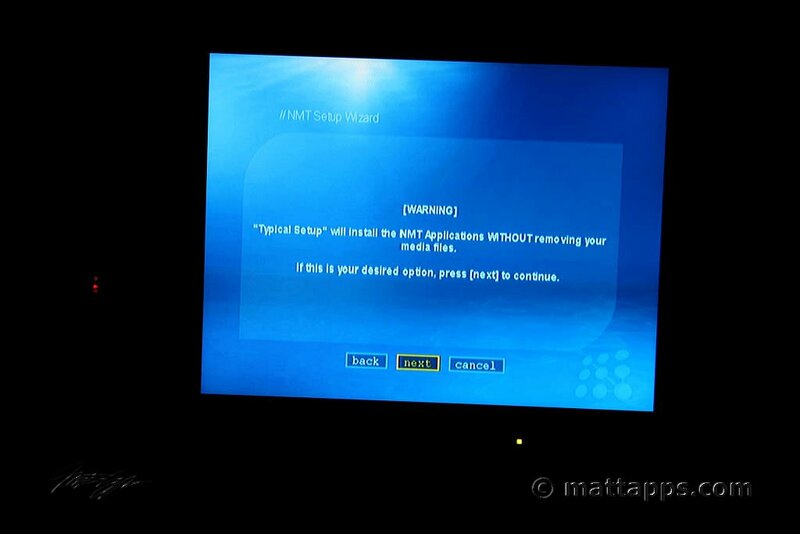 I wonder what “only non-secure mode” really means? Does that mean you can’t have your access point secured to have your PCH connect wirelessly? If that’s the case, I wouldn’t think most people would be too interested in opening up their router just to connect a PCH. I’ll stick to homeplug. I am pretty sure that “only non-secure mode” means that any wireless security is not supported. This will likely be a problem for most people, my WAP has the ability to allow non-secured connections outside my WPA secured connections and then I can limit those connections based on MAC address from the network card. Not the best security but certainly better than nothing. I have installed my HDD (500GB) but i can not find it from my computer. 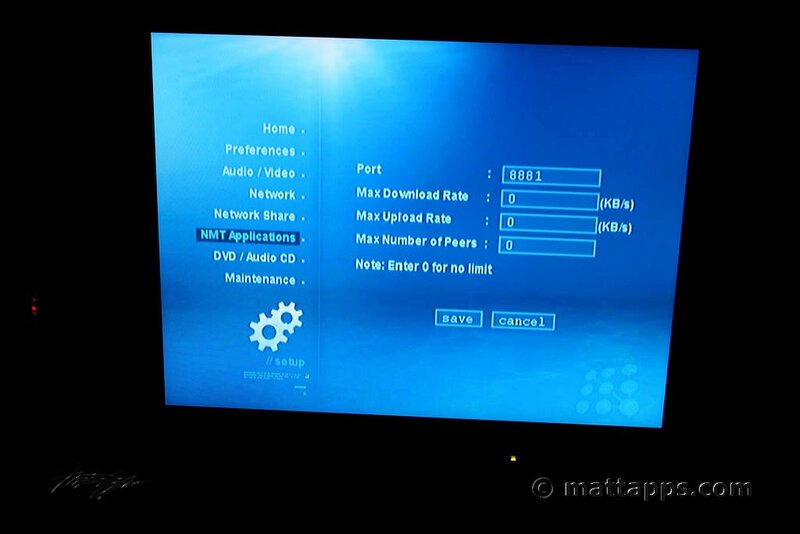 I can browse throgh my network from the PCH and play movies but i cant find the HDD in my workgroup i my network. 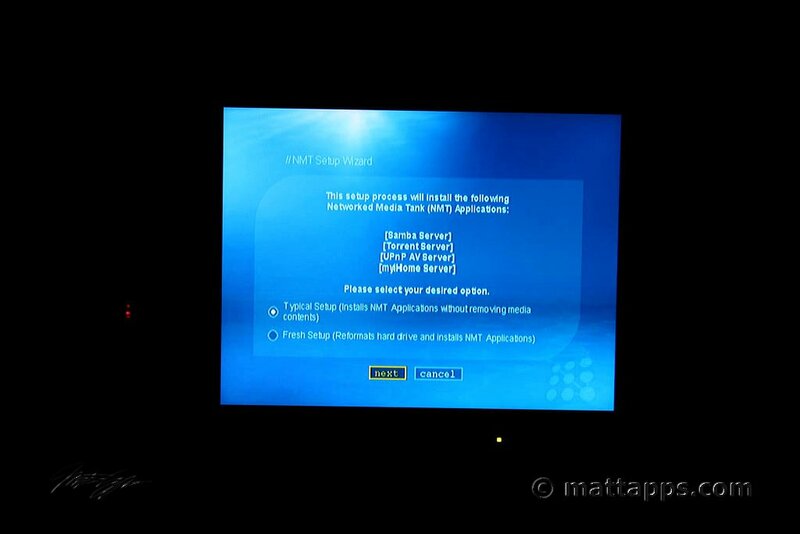 How can I see my HDD from my PC?